Jewish servicemen and women joined residents from the surrounding neighborhood to learn about their heritage and make connections all in the interests of building a self-sufficient Jewish community to serve Fort McPherson, the Atlanta-area U.S. Army base with a history dating to the Civil War. Rabbi Menachem Katz, director of the Aleph Institute, a Florida-based Chabad-Lubavitch organization that serves Jewish military personnel and prisoners, came in for the meeting, which focused on the need for more trained rabbis in the armed services. “The military is a challenging environment, especially for smaller faith groups,” said Katz. According to the rabbi, an estimated 3,000 to 4,000 Jewish personnel are spread throughout the military. Their smaller numbers, when combined with individual soldiers’ geographic locations, makes it hard to have meaningful service. 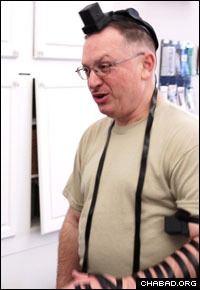 Chaplain Brad Godding, a captain and chaplain resource manager at Fort McPherson, echoed Katz’ analysis, pointing out that the Army employs just seven active-duty rabbis. The meeting at Fort McPherson was set in motion by a soldier at Fort Bragg, N.C., who lamented the lack of Jewish services in the military, said retired U.S. Navy Master Chief Jim Bradfort, the Jewish lay leader for armed forces personnel in metro Atlanta. “A servicemember volunteered to lead services at Passover at Bragg [and] was so overwhelmed by the experience that he asked for an opportunity to meet with military personnel at other bases,” said Bradford. As part of his job, Bradford coordinates and facilitates relationships among various chaplains and organizations to allow Jewish personnel the opportunity to practice their religion. He regularly works with the Aleph Institute. “It’s important to meet people of our own faith, to pray together and celebrate,” said Katz. At the meeting, attendees briefed Katz on all services offered by the Aleph Institute and shared their own experiences in the military. “I wanted to meet Jewish people on base and to try to connect with everyone and let them know that there are books, resources and people available,” said the rabbi. Besides fellowship, the meeting also allowed the group to think of ideas to better facilitate a Jewish community at Fort McPherson. Bradford said he will work to help achieve this end. “It was important to just be able to talk, get comfortable and know we can get together,” he said. A version of this story first appeared in The Sentinel, a news publication serving Fort McPherson. Increased Military "Jewish" presence I would suggest that the Chabad-Lubavitch movement consider involvement at military bases. I do not believe that the Chabad-Lubavitch movement has seen this as a major goal but I would hope that they view it as a tremendous opportunity to provide that much needed “Jewish presence” to our Jewish military soldiers and sailors and their families. What better meaning of the principles of the Chabad-Lubavitch movement could better be illustrated than to serve our Jewish military families with all their Jewish Life cycle events – bris’s, Bar/Bat Mitzvahs, Shabbats and High Holyday services and such. My son and daughter-in-law, both active duty Jewish Army Majors, have increasingly been called upon to be Jewish lay leaders at their various Army Posts throughout the world. There is a recognized LACK of Rabbis in the Army - about 7 or so worldwide (and one of those 7 is the West Point Rabbi). There doesn’t seem to be any lack of military Catholic Priests or Christian ministers and pastors – only Jewish Rabbis. My daughter-in-law (also an Army Major) will be deployed to Afghanistan in December and my son will be alone for an entire year with my 2 grandchildren (ages 4 and 7). These deployments take a toll on military families and especially Jewish military families because of the lack of military Rabbis. Where will my grandchildren go to Hebrew school? Who will provide their Bar/Bat mitzvah lessons? What about Friday and Saturday Shabbat services?